HANFORD — Kings County officials are getting ready to flip the switch on its newest solar-power-generating projects — shade structures at the county library in Hanford. The photovoltaic panel-crowned shade roofs have recently taken shape on the parking lot on Ninth Street, although they are not yet complete. Black cables are still dangling unplugged from the rooftop. Once they are hooked up, the panels will convert sunlight into a total of about 126 kilowatts during daylight hours to help offset the utility cost at the library, said Gerry Showers, county building maintenance superintendent. It’s just one part of a much larger-scale energy efficiency project the county is taking on this year as a long-term cost saving strategy. The county last year approved a joint solar venture with Chevron Energy Solutions involving the library parking lot as well as several parking lots at the Lacey Boulevard government center. The government center is part of the solar project that would produce 378 kilowatts. All the structures are expected to be complete between June and August. The entire project is estimated to meet 16 to 17 percent of the center’s energy needs. The $5.9 million project is expected to save about $41,000 a year on utility costs for the first 15 years and about $12 million over the 30-year life of the project, Showers said. The county has taken several steps in recent years to achieve energy savings, including construction of an on-site, state-certified cogeneration plant to help power the government center. 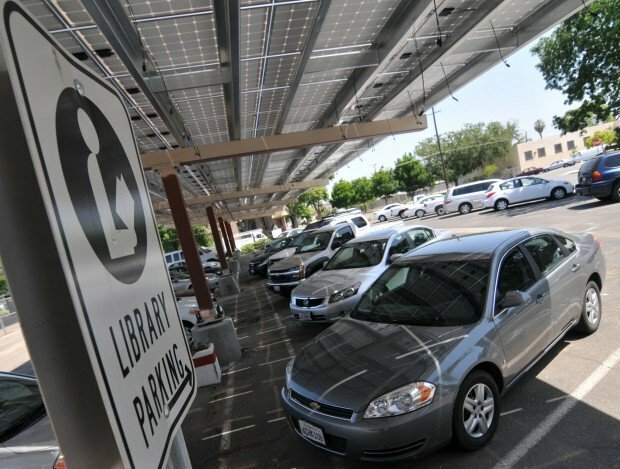 Solar panel-topped parking shade structures are the next step in the county’s effort. The county is also using the opportunity to upgrade parking lot and landscaping lighting while overhauling the HVAC (heating, ventilation and air conditioning) units serving the government center, Showers said. County facilities in the outlying areas, such as fire departments and libraries, will also get a lighting retrofit. County library Director Natalie Rencher said the energy project will benefit library operations. The Hanford library has enjoyed some facility improvements lately — the kind of improvements that could attract more patrons. The Hanford branch library recently used a $15,000 grant from the California State Library, as well as private donations and funds raised by Friends of the Library, to add Family Place features to its children’s area, which is now marked with a mural and comfortable couches. Rencher said the goal is to create a Family Place at the Corcoran branch next. The Hanford branch is also in the process of creating a laptop lounge and redesigning the teenagers’ section to attract more young visitors, she said. The reporter can be reached at 583-2429 or eyamashita@HanfordSentinel.com. 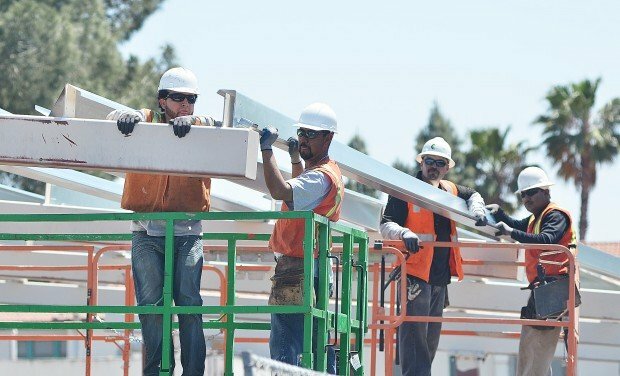 Solar panels in Tree City USA? Solar is great but trees are better! !